Staff was very nice and helpful. One of the light bulbs was out in our room and the gentleman that came to change the bulb was friendly. My kids loved the pool area and the fitness room was nice. The apartment was extremely clean and well appointed. The beds were very comfortable. Très belle appartement, et très bon service. Easy access to subway and bus lines and across the street from many attractions (Biodome, Planetarium, Olympic stadium). Close to Olympic stadium but far from downtown. Went to the Blue Jays games at Olympic Stadium. The Biodome, Insectarium, Olympic Stadium and a big park are nearby so there is lots to do, very close to the hotel. We planned to spent 12 mins to walk to the Olympic Stadium, but friendly staff told us they offer free shuttle back and forth. Olympic Stadium is located in a vibrant area of Montreal known for its stunning architecture and popular art scene. Montreal is home to 911 hotels and other accommodations, so you can find something that's perfect for your stay. 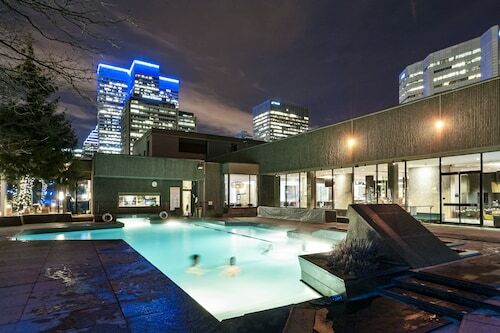 Hotel Universel Montreal: This 3.5-star hotel features a restaurant, an outdoor pool, and an indoor pool. 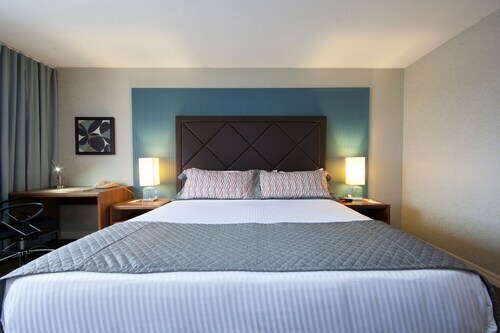 It's a favorite with Expedia travelers for its proximity to the airport and comfortable rooms. A Haven of Welcome for Your Holidays or Short Term Stays in Montreal: Amenities in this guestroom include a kitchen and a living room. A Haven of Welcome for Your Holidays and Short Term Stays in Montreal: Amenities at this property include concierge services and an in-room kitchen. Now that you've visited Olympic Stadium, you can explore the sights within just a few miles of the area. You'll want to browse the collections at Montreal Biodome, Montreal Museum of Fine Arts, and Biosphere. Sights like Old Port, Notre Dame Basilica, and Phillips Square are must-sees while exploring the area. You can check out the local talent at St. Denis Theatre, Place des Arts, and Denise-Pelletier Theater. Montreal Botanical Garden and La Ronde Six Flags are some sights worth a visit in the area. Old Port of Montreal is also located 3.5 mi (5.7 km) from Olympic Stadium, and Sainte-Catherine Street is 3.6 mi (5.8 km) away. Montreal Chateau 8 Mills From Historical Old Montreal!bachelor Party!!! Flights from Calgary Intl. to Juan Santamaria Intl. Flights from Calgary Intl. to Port Columbus Intl. Flights from Pearson Intl. to Northwest Florida Beaches Intl.